I am always on the hunt for good skincare. But then again, who isn't? Good skin is the ultimate foundation. So about a month and a half ago, Qlabo reached out to me and I have been trying out two of their products since. 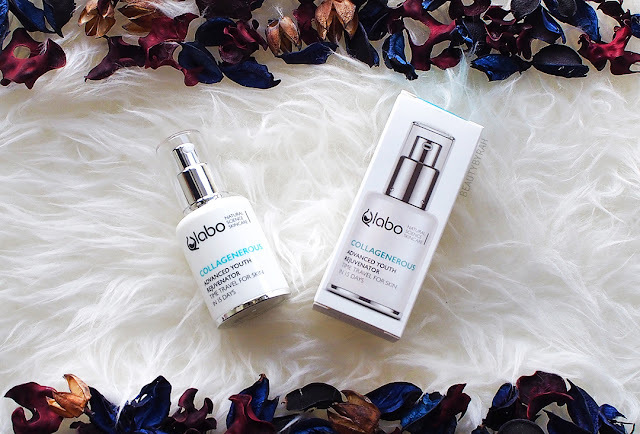 Qlabo provides swiss-engineered skincare with products specifically excluding known irritants (a point that got me extremely interested as the amount of products on the market with harsh, sensitising and irritating ingredients are mind-blowing). 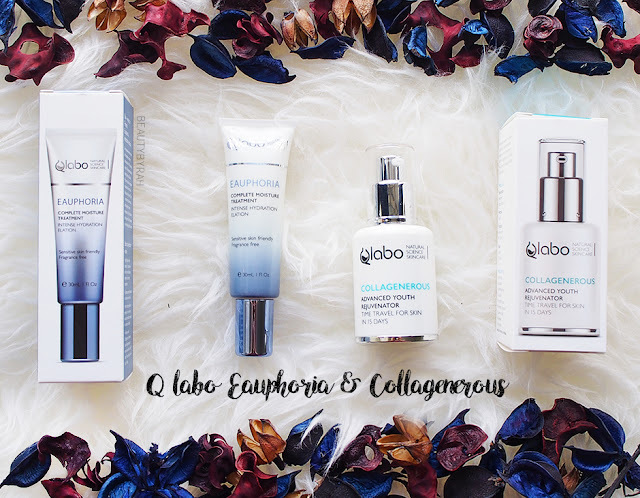 I got to try their Eauphoria Complete Moisture Treatment and Collagenerous Advanced Youth Rejuvenator (great play on words, for sure). 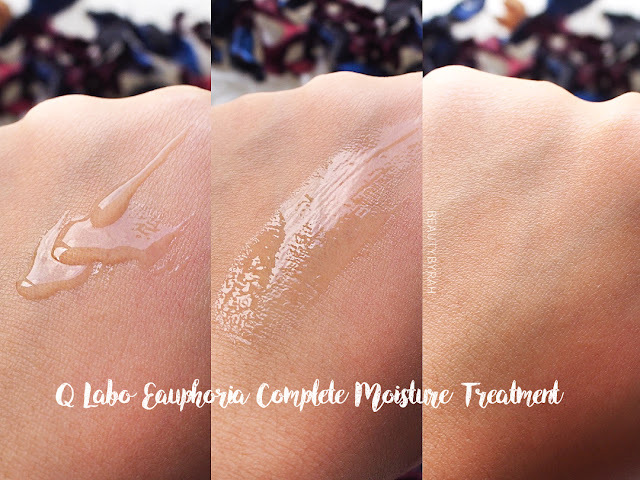 The Eauphoria Complete Moisture Treatment is a hydrating serum that is to be applied after cleansing and moisturiser. A highly moisturizing lotion-gel that instantly hydrates and gives skin lasting radiance and a healthy glow. Eauphoria infuses moisture deep within skin’s surface making a significant difference in the short and long term. Meticulously formulated for sensitive skin. It comes in a squeeze tube with a good size nozzle. The product comes out really easily, so no excessively strength is needed to squeeze the product out of the tube (I've been there, and it is tiring, I gotta say). That being said, I highly suggest storing it upright as the product has low viscosity and can flow out of the nozzle at times, making it slight messy. 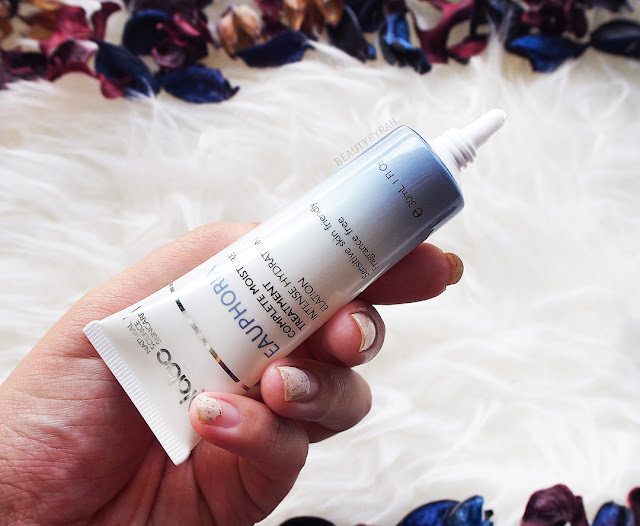 This has a watery gel texture which blends really easily and quickly into the skin. It has a slight scent to it (from the rose water) and it gets absorbed in a matter of seconds. This is great as I will not be standing there waiting for it to sink in so that I can move on to the next step. INGREDIENTS : AQUA (WATER), ROSA DAMASCENA FLOWER WATER, PROPANEDIOL, NIACINAMIDE, GLYCERIN, METHYL GLUCETH-20, POLYSORBATE 20, HYDROLYZED VEGETABLE PROTEIN, CARBOMER, ETHYLHEXYLGLYCERIN, CHLORPHENESIN, TREHALOSE, DISODIUM EDTA, SODIUM HYALURONATE, SODIUM HYDROXIDE, SODIUM BENZOATE. After analysing the ingredients, I am pleased. The ones in blue are considered the best possibilities of ingredients according the Paula's Cosmetic Ingredient Dictionary. Sodium hydroxide is marked in red as it is an average ingredient with potential to sensitise the skin as it is a highly alkaline ingredient. However, as it is the second last ingredient, its concentration should be too small for it to have effects on the skin. The rest are good ingredients, with none standing out as bad (irritating/sensitising/damaging the skin barrier). 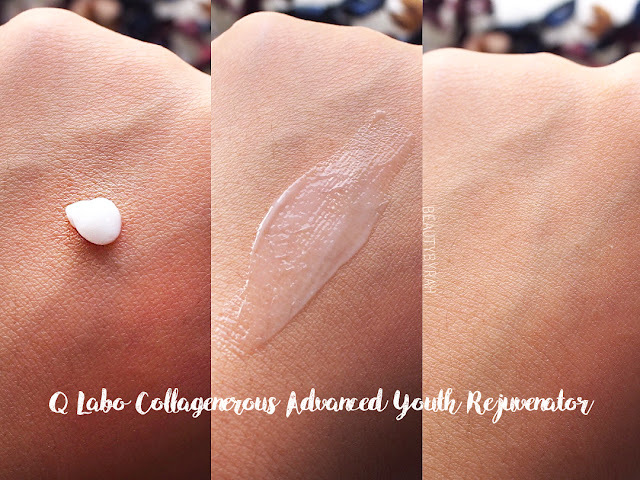 The Collagenrous Advanced Youth Rejuvenator is a moisturiser that is meant to reduce the effects of time on the skin. 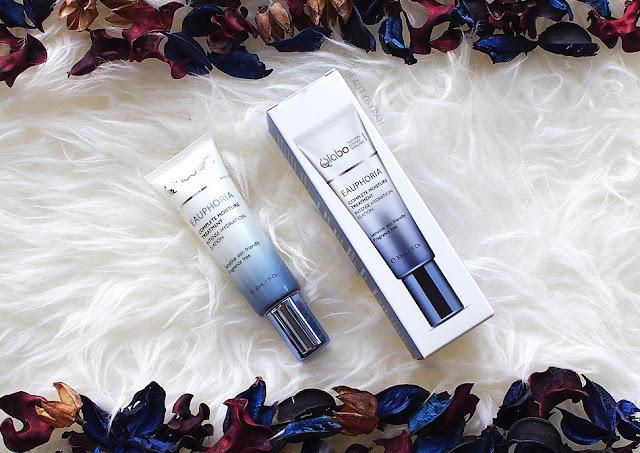 A multi-dimensional, high-performance moisturizer designed to turn back time for your skin. 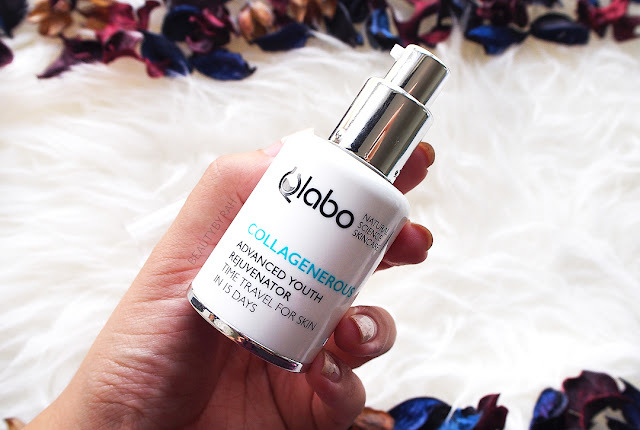 Collagenerous visibly reduces fine lines and wrinkles, restores firmness and elasticity, replenishes hydration and soothes inflammation. Meticulously formulated for sensitive skin. It comes in an opaque bottle with a pump, making it both convenient and hygienic. Like I stated in my other skincare reviews, I always approve when skincare comes in an opaque packaging with a pump (instead of a jar or clear packaging) as this helps to maintain the integrity of the beneficial ingredients for a much longer period of time as they are not prone to degradation by air or light! This is key, as you do not want to be spending your hard earned money on something that would render pretty much ineffective the moment you open it up! This moisturiser is a creamy and opaque. It is not a heavy cream at all - when applied to the skin, it sorts of transitions into a gel-ish texture that glides onto the skin with minimal tugging. It does not leave any residue on the skin and is absorbed quickly as well. INGREDIENTS : AQUA (WATER), DIMETHICONE, POLYACRYLATE-13, PROPANEDIOL, CYCLOPENTASILOXANE, HYDROLYZED COLLAGEN, SILYBUM MARIANUM SEED OIL, CAPRYLIC/CAPRIC TRIGLYCERIDE, POLYISOBUTENE, GLYCERIN, CYCLOHEXASILOXANE, HYDROLYZED VEGETABLE PROTEIN, ETHYLHEXYLGLYCERIN, ALLANTOIN, CHLORPHENESIN, TREHALOSE, XANTHAN GUM, POLYSORBATE 20, DISODIUM EDTA, LAMINARIA OCHROLEUCA EXTRACT, METHYLGLUCOSIDE PHOSPHATE, SODIUM CARBOXYMETHYL BETA-GLUCAN, PENTAERYTHRITYL TETRA-DI-T-BUTYL HYDROXYHYDROCINNAMATE, COPPER LYSINATE/PROLINATE, SODIUM BENZOATE. Like above, the ones in blue are considered the best possibilities of ingredients according the Paula's Cosmetic Ingredient Dictionary. The rest are good ingredients, with none standing out as bad (irritating/sensitising/damaging the skin barrier). As I had an allergic reaction in the past few months, my skin had become dry and seriously dehydrated, so I usually add an additional layer of moisturiser atop this to help my skin from drying out. That being said, my skin was extremely sensitive after the allergic reaction and I was afraid of trying out any new skin care products. I'm glad to report that these two products were very gentle and did not agitate my skin at all. I have been using this for about a month now so I feel that the trial time is adequate enough for me to share my thoughts about them. Firstly, in terms of packaging, I definitely do approve. The texture of these products make it perfect for Singapore's hot and humid climate as it is does not feel heavy on the skin at all. It gets absorbed into the skin really quickly and that is always a plus point for me. Usually, there will be some tightness around my cheeks and jaw area in the evening. This is because the skin has lost some of its moisture to the surroundings (as it will, over time) and it does not help that I am stuck in an air conditioned environment the entire day. After using this combo for about a week or so, I did notice that my skin felt more supple and hydrated. I also did not feel the tightness throughout the day - great sign that the skin is retaining its moisture! This is probably attributed to the Eauphoria Complete Moisture Treatment. I like how it is able to impart so much hydration while being lightweight and non-tacky on the skin. I am fortunate to not have noticeable wrinkles on my skin yet so I am unable to comment on the reduction of wrinkles claim. However, I did notice that my skin became less red and it felt more supple after a while. This could be because the Collagenerous Advanced Youth Rejuvenator has anti-inflammatory properties and helps to soothe skin inflammation. It is also supposed to help restore elasticity to the skin - which I think it does, but I gotta keep using it to affirm this. **They do have a set for both, at a much cheaper price of USD 62, which you can check out here. Overall, I do like these products and considering their impressive ingredient list, I do say that the price is definitely worth it. It does not break the bank and yet, the quality is pretty good. For more information on Qlabo, here is their website and Facebook page for your reference! **These products were sent for a review. Only honest thoughts are shared here, with no influence from others.